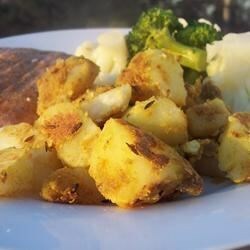 "Spiced Indian potatoes -- quick, easy and delicious!" Place the potatoes into a large pot and cover with salted water. Bring to a boil over high heat, then reduce heat to medium-low, cover, and simmer until tender, about 20 minutes. Drain and cool to room temperature. Once the potatoes have cooled, peel and cut into bite-sized cubes. Place into a mixing bowl, and sprinkle with ground cumin, coriander, amchoor, red pepper flakes, and salt. Toss gently to evenly coat the potatoes with the spices. Heat the vegetable oil in a large skillet over medium heat. Stir in the whole cumin seeds, and cook until they begin to pop, about 30 seconds. Add the potatoes; cook, stirring occasionally until the potatoes have heated through. See how to make easy oven-roasted potatoes. I added more oil (olive) and salt, but that is just personal preference. This is a really good recipe. They definitely taste like authentic Indian potatoes! Very very good. I made it with mini potatoes (cutting the larger ones in half) and used ghee as my oil. The ghee gives it a rich buttery taste. I loved it! I did not have the mango powder and used a little oregano and cayenne. Very good. my mom's recipe had d same taste! !